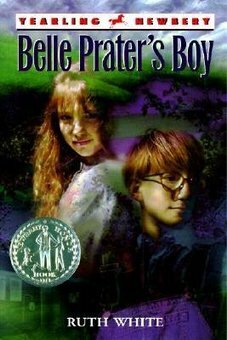 Belle Prater’s Boy is just the kind of book I love–beautifully written, moving, and full of thoughtful conclusions. It’s 1953 and Gypsy’s Aunt Belle has disappeared without a trace. Her cousin, Woodrow, comes to live in Granny and Grandpa Ball’s house right next door. He looks rough, with his hand-me-down mining clothes and his crossed eyes, but the town finds that outward appearances don’t make the boy. Gypsy, on the other hand, is as beautiful as her mother, but no one ever sees the individual beneath the golden curls. Nobody knows what happened to Aunt Belle, but Woodrow has some secrets he’s told no one but Gypsy. Together, they sort through family history and build a picture of a woman who never accepted herself. A woman who wanted to be invisible. Understanding his mother’s hurt, Woodrow is able to come to terms with her abandonment. Gypsy has scars of her own. She’s always hated her stepdad, Porter, not because he’s cruel, but because he’s not her father. But who is she really mad at? Digging through the past uncovers memories Gypsy would rather leave buried, yet with Woodrow’s help, she finally faces her skeletons. And in another crystal ball scene, Gypsy grieves her father’s death and cries to her mother: “Why did he do it? Why?” Her mother answers, “He was in a deep depression. He couldn’t accept his disfigurement. Do you remember that?” To which Belle replies, “I remember he had scars after the fire, but he was my daddy. I loved him and always saw him as handsome and wonderful.” Deep, powerful stuff with a myriad of lessons in it. Belle Prater’s Boy does get a little sappy in places, but it delivers a great story and an even better message. I give it a very high recommendation. Great review. Can I quote you in our Goodreads “Parents of Tweens” group?